These little sticks that can be twisted every which way are intriguing, but what exactly can children do with them? 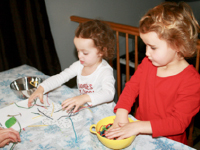 I tested Wikki Stix with two young girls who are 2 ½ years old and 4 years old in Isabelle's daycare. 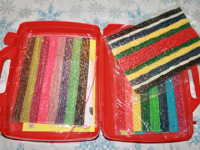 Among the available products, you will find this plastic suitcase filled with 144 Wikki Stix. 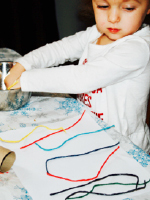 Wikki Stix are tiny wax-covered sticks that can be bent and straightened repeatedly. They adhere to most surfaces and the manufacturer states that they are non-toxic. They come in a wide range of colors. A thin coat of wax is left on fingers after manipulating Wikki Stix, but this residue is easy to wash off and does not stain. I suggested many ways the girls could use the wax-covered sticks. Since both girls are very creative, they came up with a few ideas of their own. Wikki Stix offer many possibilities. 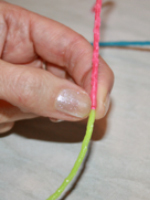 The ends of two wax sticks can easily be pressed together to create a longer stick. They are also easy to separate again if two shorter sticks are required for another creation. 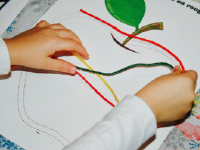 In the educatall club, you will find several printable activity sheets that can be completed with Wikki Stix. The wax-covered sticks can be used to trace letters and shapes. 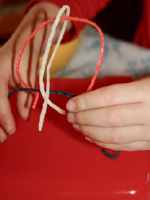 This activity is perfect for developing fine motor skills and preparing children for school. 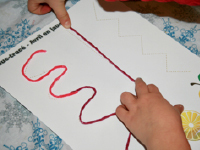 In the educatall club's "Educ-trace" section, I found several activity sheets that were perfect for exploring Wikki Stix. The wax sticks are also perfect for connecting two items. 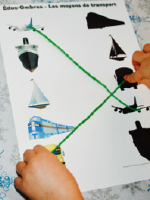 The picture below shows the Wikki Stix being used to complete an "Educ-shadows" activity sheet. 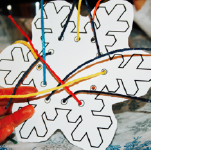 They could also be used for a connect the dots activity to create a shape outline. The use of Wikki Stix to complete a drawing makes fostering creativity possible. The wax sticks are great for representing a character's hair, creating a flower in a vase, or completing a snowman's face. You will find several printable documents perfect for this type of activity in the "Creative coloring" section of the educatall club. I printed a snowflake outline and punched holes all the way around it. The girls enjoyed threading Wikki Stix through the holes. Together, we searched for other items with holes we could thread Wikki Stix through. Note that the holes must be quite large, otherwise the wax makes inserting the sticks challenging for little hands. 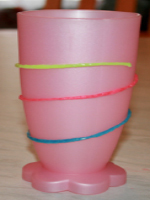 Wikki Stix can be used for three-dimensional creations. They adhere to paper and plastic. We also tried sticking them on a window, but our attempts were unsuccessful. The wax sticks also adhere to a variety of objects. They can, for example, be molded around drinking glasses to add a touch of color to lunch time or around plastic eggs to decorate them for Easter. The girls also liked wrapping them around markers, just for fun. 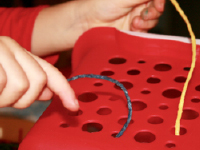 Have fun discovering ways to use them with a variety of everyday items! Another interesting idea is using Wikki Stix to draw shape outlines directly on paper. 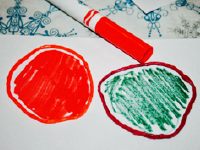 Provide markers and let children color the shapes for yet another activity that fosters creativity. 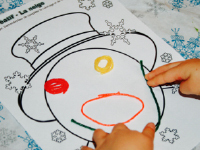 What's more, this represents a great way to help children practice coloring inside the lines. One of the girls used the Wikki Stix to create a unique masterpiece, with no model to follow. What a wonderful way to produce original designs! 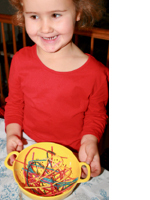 The girls suggested many other ways to use Wikki Stix. For example, they deposited them in a sieve to represent spaghetti and pressed several Wikki Stix together to form a ball. At the end of the toy test, untangling the wax sticks became an interesting game of dexterity that required a certain level of patience. Thank you to Isabelle and our two testers. I hope they will continue to have fun with their Wikki Stix.